Rylee Ann Gibbons receives the Body of Christ for the first time from her pastor, Father Francis Mulranen, at Our Lady of Fatima Church, Secane, May 13. Sunday, May 14 was a very special day for Our Lady of Fatima Parish in Secane. Archbishop Charles Chaput visited to celebrate Mass in honor of the centennial of the first visitation of the Blessed Virgin Mary in 1917 to three young shepherd children in Fatima, Portugal. On May 13, the actual centennial date, Pope Francis visited Fatima to canonize the younger two, Francisco Marto (1908-1919) and Jacinta Marto (1910-1920). They are the youngest children, other than martyrs, ever to have been declared saints. Their slightly older cousin, Lucia Santos (1907-2005), has a cause for beatification opened and almost certainly will be declared a saint at a future date. May 13 this year was also special for Our Lady of Fatima Parish because it was the date 41 children of the parish, only slightly younger than the Fatima children, received their first holy Communion. 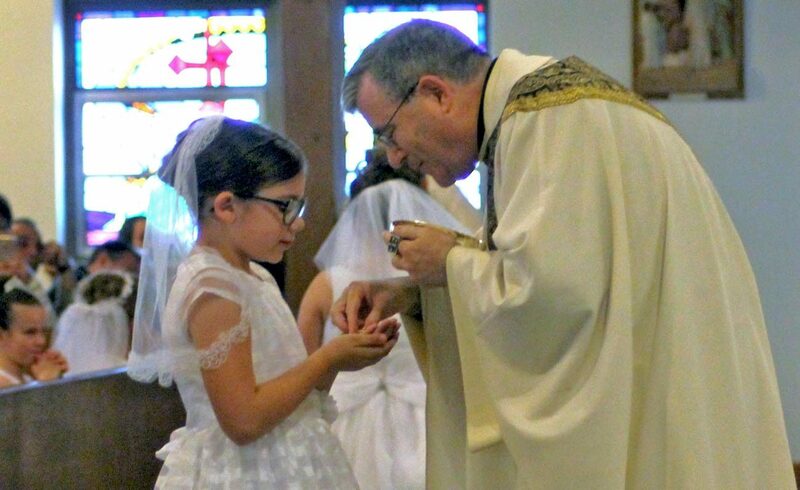 Many of the children, about 7 years of age, were really too young to grasp the historical significance of the date of their first Communion but will undoubtedly do so in the future. During a visit the angel came with a chalice and host. The angel prayed and gave the host to Lucia, who had already received first holy Communion. He then presented the chalice, the blood of Christ, to her two younger cousins who had not yet received the sacrament. 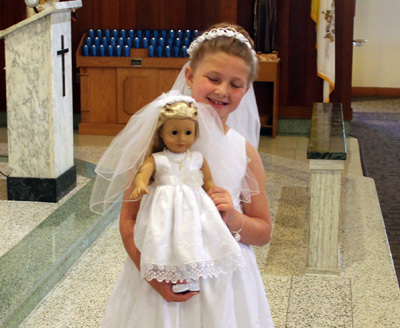 Madison Prichard is proud not only to receive first holy Communion but also of her doll Isabella, which is also wearing a communion dress given as a gift for the occasion. Father Mulranen told the first communicants that in receiving Communion, God is also receiving them. In his homily, which was mostly a series of questions, at one point Father Mulranen mentioned some time in the future many of the girls would come to church once again in a beautiful white dress and a veil, and asked if they knew when that would be. “At the May procession,” one young lady responded, clearly thinking of a more immediate future than her pastor, but nevertheless she was correct. “I’m excited, it means a lot to me,” said Farah Kabbadj, one of the communicants. 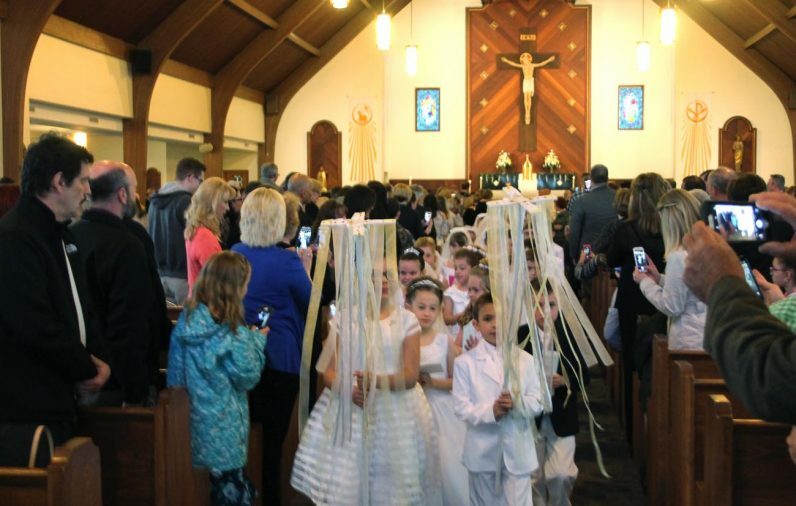 While 41 children processed up the aisle, there were really 42 first communicants. Larry Rose, whose daughter Grace was part of the first Communion class, also received as part of the congregation that morning. His dad was willing and although it was not possible at that time, Sister Joyce gave him instruction for his own first Communion with the congregation at his daughter’s first Communion Mass, and he will receive confirmation shortly. “Jesus is close to our heart,” Grace added. And surely the entire class was close to the heart of Our Lady of Fatima on this very special day. Children of Our Lady of Fatima Parish, Secane, lead the recessional at the close of Mass on Saturday, May 13, at which they received their first holy Communion.